We are Katerina & Michael Foster, a nationally published fine art wedding photography team based in Carmel, Indiana. Our clients define our style of photography as dreamy, romantic and timeless. This means, we capture the pure moments and emotion that occur on a wedding day in a dreamy light and airy fashion through both digital and film photography. Our posing is very natural and romantic, with a few formal shots thrown in. This is what our clients love most about working with us--they get to keep their focus on each other! We take a lot of pride in helping to keep the wedding day simple, carefree and organized. One large part of this aspect is the fact we sit down with all of our couples to help them lay out a rough timeline as well as a final timeline closer to the wedding day. This timeline helps our clients to get the most out of their time with us so nothing important is missed--no matter how many hours are booked! If you are planning a wedding in any state or country, please do not hesitate to contact us--we love to travel! Michael and Katerina met during the summer of 2013, as they were about to enter their senior year of college at Indiana State University in Terre Haute, IN. The two were smitten as soon as they met. In April 2014, Michael proposed to Katerina in front of the Robert Indiana “LOVE” statue at the Indianapolis Museum of Art. They chose to host their wedding day in their favorite place on Earth, Sanibel Island, FL. The ceremony was just after sunrise, in front of the historic lighthouse on the tip of the island. It was everything they dreamed their day could be. Now, they get to be third wheels to some awesome couples during their own dream weddings. Their relationship is strongly based on laughter, trust, loyalty, adventure and dreaming. The two never fail to laugh together daily, usually at each other. Majority of their free time is spent traveling, loving their bunny or shopping for antiques. Since they love traveling, they offer special rates for locations on their photography "bucket list" and have their passports ready for any couple wanting to take their love story on a journey like no other. Kat is outgoing and has a love for people and animals. She loves to get to know her couples on a friend-level prior to a wedding day so that the couple feels at ease with her and so she can know what little things to keep an eye out for that embody them and their relationship. On a wedding day, Kat looks for everything from the small smile hidden beneath a veil to the smallest detail. Her wedding work is natural and romantic with an editorial fine art approach. Any arts and crafts where she can work with her hands! She often knits new pieces for her newborn photography during long car rides. Ever since she was little, Kat has had a passion for reading and writing. She is never without a book! Kat grew up with a huge passion for performing arts. She has played a lead role in countless musicals and is a classically trained high soprano that has won a number of awards through competitions. She still misses her show choir days at Carmel High School and Masterworks class at ISU! Any day is a good day as long as she gets a cup of tea or coffee! Her first ever Starbucks experience was a vanilla chai latte. Giving back! Kat is an alumnae of Delta Gamma Fraternity from Indiana State’s Gamma Omicron chapter. Her favorite position she held was VP Foundation where she was in charge of philanthropy events and community service hours. Her favorite way to give back in college was by volunteering at the local humane society numerous times a week. Thanks to all of her time she put in attending philanthropy events and dedicating time to community service, she was presented with an award by the president of the university at the end of her senior year. Traveling is always at the top of Kat’s list! 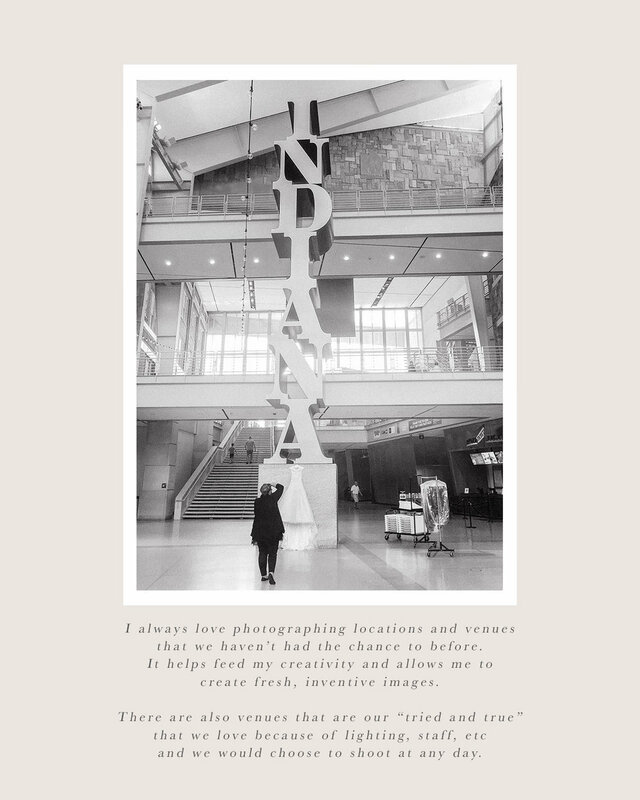 She has so many locations she wants to see and photograph! Kat's Favorite Destinations: Beach weddings! Sand, sun and water add such magic to portraits! I love experiencing new locations because it is something new and different that we haven't had the chance to capture before. We always have a blast with our clients when we travel because we take time to hang out and adventure. Kat's Dream Destinations: Pretty much anywhere I haven’t been! I love seeing wedding work from locations like Italy, Iceland, Ireland, England, Australia, Spain, Greece, etc! The open spaces are breathtaking while the architecture is unlike anything I've ever seen before. I’d really love to do an elopement or wedding in the PNW, California, South Carolina or Colorado. I could go on but I feel like I would be listing every state. Mike is a kind-hearted guy that looks shy on the outside but is a bucket of laughs on the inside. He lightens up the lives of those around him with his big smile and quick jokes. He is a dreamer, just like Kat, and is always talking about the goals he can't wait to accomplish. Originally from Michigan, he moved to Tennessee when he was in high school and moved to Indiana when he transferred schools his junior year of college. When he isn't working or shooting a wedding with Kat, you can find him on the soccer field or at the skatepark. His love of history has pushed him to start collecting antique war memorabilia and continue researching the wars that intrigue him. Like Kat, he has an immense desire to see the world before they start having kids. On a typical wedding day, Michael will be shadowing the groom while Kat is with the bride. He loves having a good laugh with the guys while still keeping them aware of the timeline. He will be a fly on the wall, capturing the day as it unfolds around him. Michael is best known for his candid, photo-journalistic shooting style and attention to detail. Soccer, skateboarding and basketball, oh my! This guy loves being active and has a hard time sitting still! He has to do something active every day or he gets antsy. Whenever the fall hits, you’ll find him either planning a trip to Michigan or driving the two of them to a local orchard to pick up his favorite treat—cider and donuts! He introduced Kat to dipping the fresh baked donuts in a cup of cider. Must be a MI thing but boy is it yummy! Michael does not function without coffee. He has both a fancy espresso machine as well as a drip coffee maker to help support his needs. He’s always itching to go to antique malls to find new “treasures” for his war collection! Just like Kat, Mike is always happiest when he has a new trip to look forward to! His “must visit” list is pretty much the same as Kat’s! Mike's Favorite Destinations: I absolutely love destination elopements and wedding, especially on the beaches of Florida! Anytime we get to travel down that way, I get excited. I think the area just calls to us. I’m always trying to convince Kat that we need to move down there. Mike's Dream Destinations: I've always wanted to visit England (not just because of my love for soccer) so I can't imagine anything more fun than capturing a wedding in London or on the English countryside! Other than that, I’d love to see Scotland and Ireland. I really love locations rich in history. Other than that, it would be great to capture a wedding in the Houston/Katy area since that is where most of my family is at now. They love simplicity and finding the beauty in their surroundings. This is why natural lighting is the key to their pure, light and airy work. They capture their clients through naturalistic posing techniques so they do not feel stiff or awkward in front of the camera and so they can focus on each other on the best day of their lives. In their bags you will find traditional film cameras as well as the latest digital gear from Nikon. Kat is an over-packer so there is always extra batteries, SD cards, lens cloths, bandaids, rain bags and more. Kat and Mike love working with their clients after their wedding days and hold them as priority clients since they are already a part of the Katerina Marie family. They have been fortunate enough to capture pregnancies, babies, anniversaries and more for their wedding clients and always look forward to reuniting with friendly faces. *Since we only book a select number of weddings per year, our calendar fills up fast. It is highly recommended to contact us as early as possible to schedule a coffee or FaceTime date to discuss the special details of your wedding day. Kat Marie Brides typically book with us 6-18 months in advance. 2019 WEDDING ANNOUNCEMENT: We are almost fully booked for the year. 2020 WEDDING ANNOUNCEMENT: We are receiving a higher than normal amount of 2020 wedding inquiries very far in advance. Next year is projecting to be record breaking when it comes to weddings so we highly recommend moving quickly on booking vendors. We rescued her from a reptile show when she was teeny tiny. She was stuffed into a small cage with other bunnies from her litter and a bunch of guinea pigs that were biting at the rabbits. She was just a little snowball with her face shoved into a back corner of the cage. We honestly did not even notice her until the little girl handed us the only one she could get her hands on. As soon as we held her scared little body against our chests, we knew she needed to come home with us. There is so much that goes into learning about how to care for rabbits properly and we are excited to help educate anyone interested in adopting one of these intelligent little babes. - Libby’s 100% Pure Pumpkin Puree! She has a small teaspoon around dinner time most nights. - Small Pet Select fresh high fiber hay, mini healthy snackers, apple orchard sticks, clover chains, meadow loops, pea sticks and hanging mobile! She might be one of their best customers. - Forehead kisses, booty love and neck love! This little girl loves to snuggle when it’s on her terms. She usually comes up to the couch for love one hour in the morning from Kat and one hour in the evening from Mike. - Sunbeams! Ever since she was little, she would find the perfect spot to nap in the sunbeam.